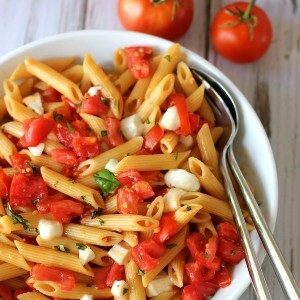 This recipe for pasta with fresh tomato sauce and mozzarella is my last hurrah to summer tomatoes. 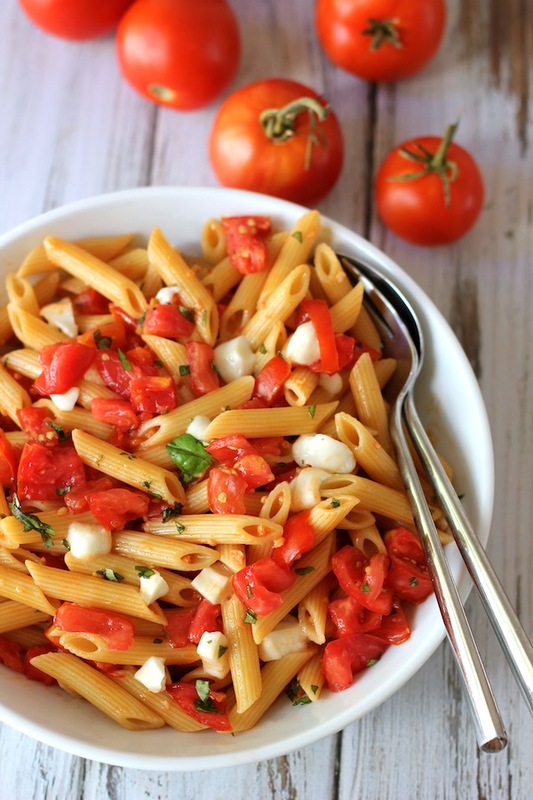 I’ve been experimenting the last couple of weeks trying to find the perfect way to use fresh tomatoes in a pasta dish and finally found the easiest, tastiest way to use up all those summer tomatoes. The biggest problem I’ve had making a fresh tomato sauce is, once the tomatoes are diced, there is too much tomato juice. I tried sautéing the diced tomatoes in a little olive oil and garlic but the sauce was too soupy – so I ended up having to cook them for a long time which caused the tomatoes to lose all shape – and you’re kind of defeating the purpose of using fresh, summer tomatoes if you cook them down into a tomato puree. I tried adding fresh tomatoes uncooked to pasta but again there’s just too much tomato juice – making everything kind of watery. I thought about straining off the tomato juice – but that seems a waste. Then I saw this technique on Food52. It’s from a Michael Ruhlman recipe. Basically, you chop the tomatoes, salt them lightly, and let them sit as they release their juices. Next, sauté some garlic and add the tomato juice (not the tomatoes) to the pan. You’re creating a sort of tomato juice beurre blanc, which is basically a fancy way of saying you swirl cold butter into the hot tomato juice and garlic mixture to create a sauce. Finally, toss cooked pasta with the tomato juice/butter sauce, add the chopped tomatoes, a little fresh basil and some fresh mozzarella and it’s done. All I can say is it was perfect. I used less salt, garlic and butter than the original recipe called for. And everything worked out fine. You can use any pasta shape you like for this recipe. I used penne. My tomatoes were very ripe so I only used a little salt on the tomatoes – they released a lot of juice with just a 1/2 tsp of salt added. I used unsalted butter because that’s what I had on hand. Salted butter will probably be just fine. I added the mozzarella at the very end – after the pasta had cooled slightly – since I didn’t want a lot of melted, stringy cheese. You want the tomatoes to be the star in this dish. This is an easy, fast dish to put together. You want to have everything prepped before hand so you can just add each ingredient at the right time without feeling rushed. Adapted from this recipe from Food52. Food52 is a great resource – with lots of wonderful recipes – so go check it out. Recipe originally from Michael Ruhlman’s site. Thank you, Michael, for a great recipe! 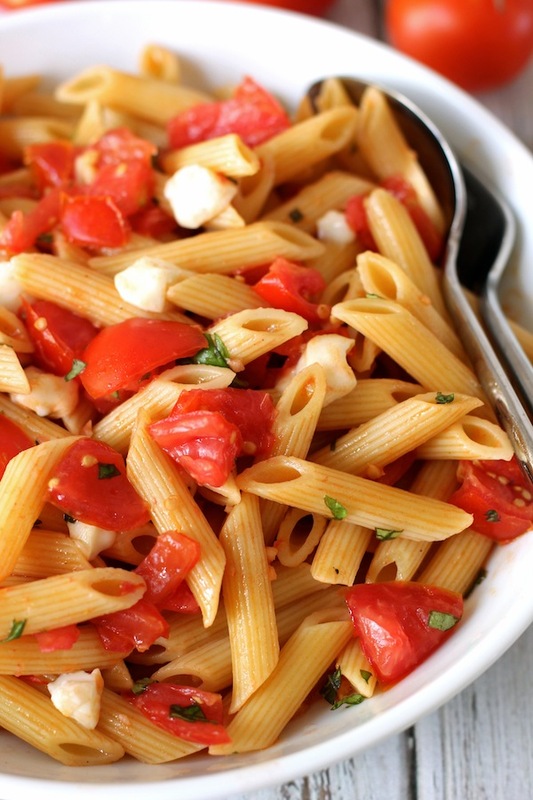 An easy summer pasta dish using fresh tomatoes and mozzarella. Chop tomatoes into a medium dice. 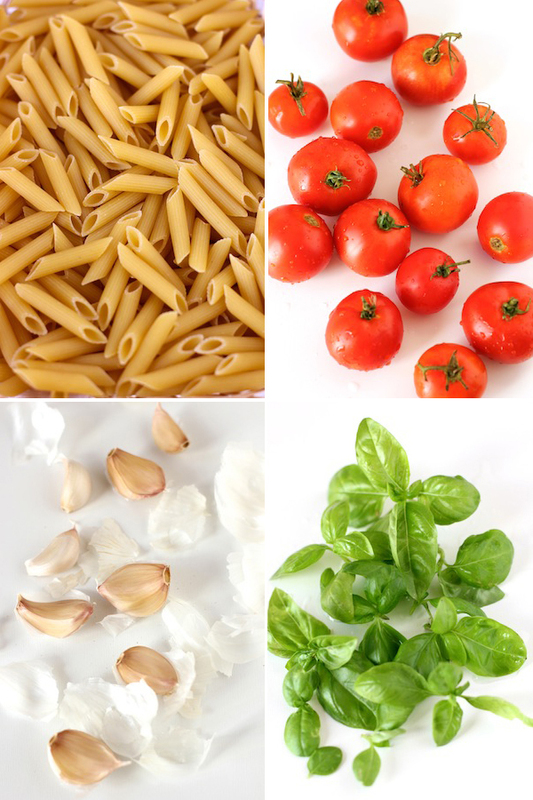 Add 1/2 tsp of salt and half of the minced basil to the diced tomatoes. Stir to combine and let it sit as you prep the other ingredients and bring the water to a boil. Bring a large pot of water to a boil. Add pasta and bouillon. Cook pasta according to package instructions. While the pasta is cooking, heat a large sauté pan over medium high heat. Add the olive oil to the pan. Next add the minced garlic and stir the garlic to cook for 30 seconds. Don’t let it burn. 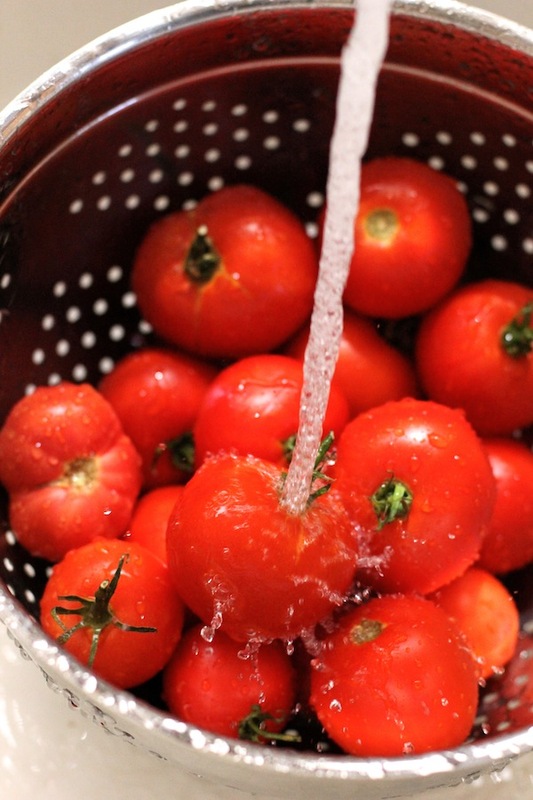 Using a fine mesh sieve, strain the tomatoes over the sauté pan, so the tomato juice flows directly into the sauté pan. You want to add all the tomato juice to the garlic cooking in the sauté pan. Set the tomatoes aside and cook the tomato juice over medium high heat for a minute or two until the tomato juice thickens slightly. Drain the pasta when ready and set to the side. Add the 3 tbs of butter to the tomato juice/garlic mixture in the sauté pan. Stir or swirl pan as the butter melts so it is fully blended into the sauce. Once all the butter has melted, turn off the heat and add the cooked pasta to the sauce in the sauté pan. Toss to combine. Next, add the tomatoes and black pepper to the pan and toss. Transfer pasta to a bowl. Add the remaining basil and diced mozzarella and stir to combine. Watching Wimbledon on TV, eating this lovely light meal, a glass of red wine, what could be better! Hi Mom – wish I was there with you – I need a glass of wine right now and it’s only noon! Wow! It is really good (I am currently eating it 🙂 ) ! Hi Chloe – I thought the same thing when I made it! So easy and so good. Thanks for letting me know. Have a great rest of the weekend! Oh Gosh this pasta looks so delicious and flavourful. This is the best season of the year to eat fresh tomatoes. They look so juicy! And your process photos are gorgeous! Thanks so much, Olivia. Have a great weekend! This looks great, Geraldine! I love the idea of making a sauce with the fresh tomato juices. Your photos are beautiful! Thanks so much, Julia. This is a super easy recipe – hope you try it. Have a good one! Thanks, Greg! Have a great day. Hi Olivia – Caprese anything in my books is a good thing! Have a good one. Stunning, Geraldine! Your process photos are beautiful! 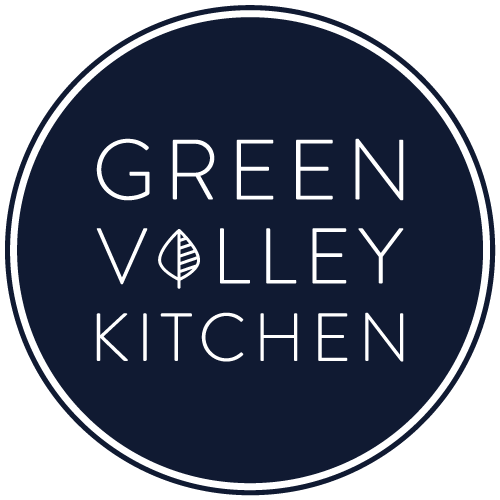 Thank you for this inviting recipe and testing and retesting for the perfect outcome! I’m looking forward to this! Thanks so much, Traci! Let me know if you try it. Have a good one! Thanks so much, Crystal. Definitely try it – it was soooo good and easy. PS: Your comment was in my spam folder 🙁 – don’t know why – sorry for the delayed response.